Is the end of the age of the tank on the horizon? Love it or hate it, Overwatch’s esports scene has been dominated by round after round of tank-heavy play over the last couple of months. It got to the point where some players had to change out of their favorite DPS characters and into a tank slot, much like FaZe Clan’s ShaDowBurn has done by having D.Va compliment his frightening Genji play. 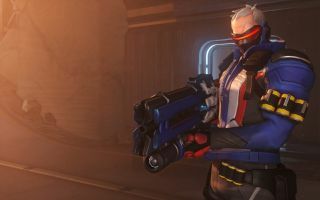 However, we’ve also seen some meta-shattering innovations and solid group compositions brought about by patches to Soldier 76 and Symmetra, as well as the addition of Sombra. Let’s take a look at some of these changes, and how professional teams have successfully utilized these unique characters within the tank meta at the NGE Winter Premiere. On November 15th, a patch was released that gave a significant DPS boost to S76, bumping his damage per shot from 17 to 20. Anecdotally, this change occurred late into OGN Overwatch Apex season one, much to the chagrin of some of the players there. But a great many more embraced the shift both at Apex and beyond, as S76 became absolutely devastating in the hands of hitscan madmen such as EnVyUs’ HarryHook. While S76 is clearly a menace unto himself, it’s when you weave him into the meta that his utility truly shines. Compared to the other DPS characters, the synergy between S76 and most of the tanks is unparalleled. When Winston, Road Hog and D.Va force enemies out of position, S76 has the mobility and stopping power to pick them off with remarkable ease. At the Winter Premiere, Luminosity did a phenomenal job of keeping Citizen 7 off the point in the Sanctum of Nepal. Through all of the chaos, Eissfeldt, LG’s flex player, was able to play mop-up after his trio of tanks kept the targets scattered and exposed. The positioning in this particular play is crucial. Eissfeldt is between his tanks, with Road Hog ahead of him and both D.Va and Reinhardt behind him. He’s able to provide auxiliary damage on multiple targets from this position, even helping to shut down a Graviton Surge. Using Tactical Visor as D.Va and Rein created an opening sealed C7’s fate, resulting in a full team wipe. When December and season three came around, they brought with them a meaty patch to one of the more interesting characters in Overwatch. Symmetra now has another ultimate option in her Shield Generator, increased range on her normal attack, a forward-moving Photon Barrier, and can now place six sentry turrets instead of three. These changes have done much for her popularity both on the ladder and in major tournaments, though the meta will have to develop more before we start seeing teams use her with regularity. Right now, point A of Temple of Anubis seems to be a popular area for tinkering with a Symmetra-centric defense, with players such as EnVyUs’ InternetHulk and Immortals’ Verbo having varying degrees of success with the newly improved heroine. Immortals and Luminosity were in a tied match when it came time for Temple of Anubis at day two of group play at Winter Premiere. Luminosity went with a dive composition, and Immortals countered with a meta build of four tanks and Verbo on Symmetra. The fighting was electric as Luminosity kept pressure on the point with their mobile bombardment, and it seemed as though they had the upper hand a couple of times. But Immortals’ ingenious Symmetra play kept them in the fight by using all six turrets to defend the crucial portal in a room adjacent to the point. Considering how far the first point is from the spawn room on some maps, it wouldn’t be surprising if we started seeing four-tank compositions built around Symmetra. Being able to instantly reinforce a point is invaluable, especially since D.Va and Rein don’t have to burn their acceleration abilities in the process. Shield Generators and turrets on points closer to spawn rooms offer further theorycrafting considering the characters being shielded. After months of various teases by Blizzard, Sombra was finally released in November. Though the stealthy hacker specialist came highly anticipated, she’s had a hard time winning over the trust of the Overwatch community. It isn’t that she’s a bad character, it’s just difficult to build a ladder team with her when the tank meta is so solid. She has, however, been seeing some love at the pro level thanks in no small part to CompLexity’s insistence on working her into a composition with torkTJO behind the keyboard. So far, the key to unlocking Sombra’s potential has been a combination of patience and pairing her with Zenyatta for a damage boost, as we saw at Winter Premiere. When Kungarna dug in outside the hangar door on Gibraltar, it seemed as though CompLexity had a literal and figurative uphill battle on their hands. But watch what happened when torkTJO goes invisible and flanks Kungarna’s tank line. As soon as EMP is dropped on top of the tanks, CompLexity’s own tanks advance immediately, taking advantage of the six seconds of distorted audio and blocked abilities. All the while, torkTJO continues to be added value by staying alive and chipping away at available targets. It’s difficult to say whether or not Sombra-centric compositions will open up this meta (they do require quite a bit of finesse), but if more teams begin to enjoy success with her, it is a distinct possibility. Overwatch is still a very young game, and with yet another patch on the horizon, it’s difficult to say how much longer the tank meta will be around. Though teams are starting to get a bit more bold with character picks, the 3/2/1 composition is still easily the most favored at the esports level. With Overwatch League set to launch this year, perhaps we will see some marginalized talent shock us with surprise strategies. Don’t hold your breath, though.